Have you ever wondered how some of the opinions you hold came to be? By that I mean having an opinion on something you have no first hand experience with. Take the Porsche 924/944/968 for instance. I’ve only had about 15 minutes of passenger seat time in a very well worn 944, yet I know the 944 is superior to the 924 in just about every way. Why? Because I read it somewhere? Because some some Porschephiles couldn’t get past the Audi motor in the original 924? What’s funny is that my opinion carried over to the models of the respective cars. Because the 944 is superior, then the 944 model is the one I want. 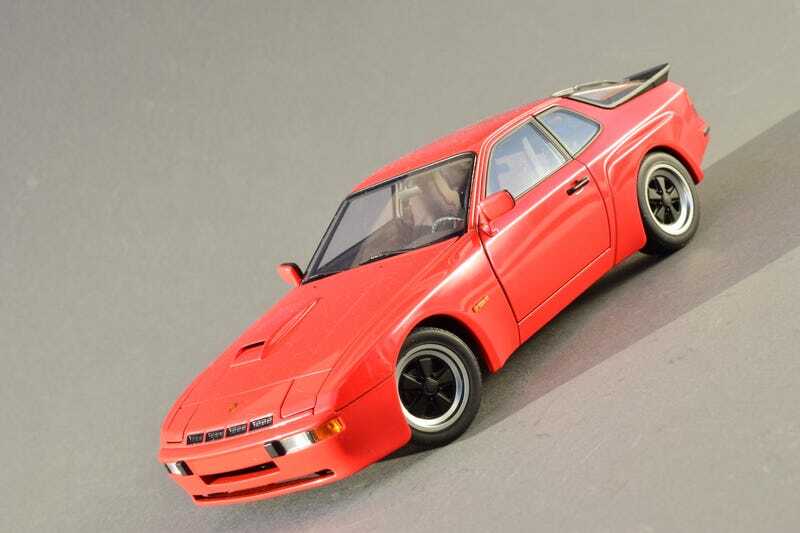 But the 944s sold out before I could get one. Sure they’re readily available on ebay, but they’re just inside of that price zone that makes me question how bad I really want it. But while I’ve been waiting for that irresistible deal to pop up on a 944, an alternative was sitting right under my upturned nose; the 924 Carrera GT. Up until I saw this model, the only Carrera GT I’d ever heard of was a mid-engined, 10-cylinder exotic. As luck would have it for me, the 924 CGT served as the aesthetic basis for the 944, so it’s almost like I got one anyway. Headlights aren’t linked, so no gif for you! As to the model, there’s not much to say that I haven’t already said in regards to AUTOart’s work. The are a couple of negatives I can fling toward it though; my model has a fair amount of paint rash on the driver’s side fender and trailing edge of the hood, and the hatch feels a bit flimsy in operation. I don’t know of any of my other AUTOart’s having paint rash, so I’ll give them a pass here and hope my model is the exception to the rule. Apart from those two issues, all the good things typically said of an AUTOart model apply here as well. But the best thing about the model is the price. It seems that I’m not alone in carrying over my preference for the 1:1 into 1:18. So while a 944 will run you in the neighborhood of $150 USD, the 924 CGT can be yours for $80. Get it while you can. I know at least one person who’ll like this.